Santa Monica’s 41 Ocean restaurant—it’s attached to the exclusive 41 Ocean Club—is shifting gears under new chef Jimmy Martinez. The menu is now full of Latin-inspired tastes of California, with touches of Spain and Puerto Rico, where the chef’s family originates. Martinez is a natural in the kitchen, and was asked to work alongside Wolfgang Puck at Spago. He was only 19 when he was working the fish station under Puck. Though only in his early 30s, Martinez is a veteran chef with over a dozen years under his apron including stints at Mastro’s Steakhouse and the nearby Boa Steakhouse in Santa Monica. It’s safe to say he knows a thing or two about volume. Originally, 41 Ocean was an American concept. A few months ago, it got a makeover using farmers’ market ingredients for ceviches influenced by the flavors of South America, the Caribbean, and Mexico. There’s now a classic swordfish ceviche sweetened with papaya. 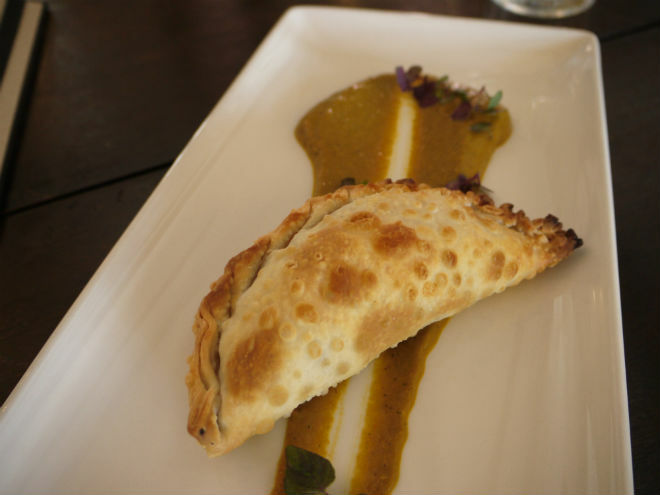 Martinez’s Puerto Rican roots shine through in the crispy wild mushroom empanada filled with a blend of shiitake, oyster, and shimeji mushrooms and a 63-degree egg set on a spread of sofrito—Puerto Rica’s garlicky, citrusy mirepoix. The nopales (cactus) farmers’ market salad is a worthy tribute to Mexico’s pre-Hispanic green bean, and the chorizo pate surprises the palate with additions of raisin walnut bread and pickled kumquats. There are tacos made with the 50/50 tortilla blend of flour and corn, and there is a full menu of skillet-moist meats and seafood resting atop a mélange of thinly sliced vegetables. The menu is all about the way Martinez likes to cook at home, with thoughtful nods to his own background, plus the right touch of refinement—he’s avoiding the usual clichés. With with a view of the Pacific Ocean across the Santa Monica Pier…why didn’t anyone think of this before? 41 Ocean Restaurant, 1541 Ocean Ave., Suite 120, Santa Monica, 310-879-4141 or 41ocean.com.